The CatsAndDiabetes.com story starts with a very handsome Burmese boy, my beloved 2Pac, who embarked on his diabetic journey in February 2006 at the tender age of thirteen. The journey continued as the mother of the handsome cat learned to navigate the myriad complexities of life with a cat with diabetes mellitus. The learning curve was steep yet slow. In February 2006, when my beautiful Burmese boy was 13 years old, he stopped eating, stopped interacting, and was slowly slipping away from me into a coma-like state. He went to the vet who conducted a multitude of tests and was subsequently diagnosed with Type 2 diabetes. The vet was relieved when he told me on the phone, ‘your cat has diabetes’. He was relieved because he now knew what was wrong and that it was easily treatable. I cried. I immediately drove my boy back to the vet who tried to teach me how to inject my baby in his neck twice a day. I couldn’t stop crying, so the vet administered the insulin for me and sent me home to practice on an orange. I remember feeling so scared and alone. I felt like my world had folded in on me in an instant. Did you? I’d never heard of feline diabetes before. I didn’t know such a thing existed, and I certainly didn’t have any support beyond my vet’s very expensive advice. Now, five years later and a whole lot wiser, I am regularly testing my cat’s blood glucose levels, checking his urine for ketones, and finding new and exciting dietary options for him so that he can dine like a prince without the carbs. It was out of my own long and difficult journey that I created Cats and Diabetes to bring together everything I’ve learned and present it to you. Within these pages I share my long journey and simplify it for you. CatsAndDiabetes.com has veterinary practitioners who provide information and advice on learning, understanding, monitoring and caring for your diabetic cat. There are free tools that you can download. And, in our shop you will find everything you need to make managing your cat’s diabetes painless. While my 2Pac crossed the Rainbow Bridge on 30 May 2012, his legacy lives on in this space. The very fact that he lived so many years with diabetes has meant that I could learn as much as I have and pass that knowledge on to you. I wish you the very best for your sweet journey with your beloved, as I traveled such a sweet journey with mine. 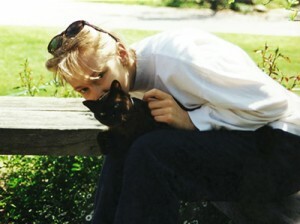 I was blessed to have so many precious years with such a loving cat.